Sea otters are in a race against time. To survive, they hunt for clams, crabs, urchins, snails, mussels, and abalone down to 100 feet deep. Otters must work quickly since they can hold their breath for only 1-3 minutes per dive, and their prey are often found in rocky crevices or under heavy sand. How do sea otters find enough food to survive each day? Which senses are used to locate food? How are decisions made about what to eat and what to ignore? Scientists have discovered that sea otters are fast decision makers—with the help of their ultra-sensitive paws and whiskers. 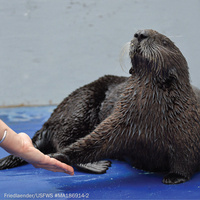 Join the Seymour Marine Discovery Center to explore why the sense of touch may be useful to a hungry sea otter, as well as how researchers work cooperatively with animals to learn how they perceive the world. Science Sunday is for everyone interested in the world around them. -Lectures are one hour long and take place at the Seymour Marine Discovery Center at 1:30 PM. -Doors open to the lecture hall at 1:00 PM. -Lecture passes are available at the admissions counter at 12:30 PM. -Seating is limited and first-come, first-served. No late seating. -Lectures include time for a few questions at the end. -Science Sunday is free with admission, and always free for members. Recommended for ages 10 and older.